We’d love your help. Let us know what’s wrong with this preview of The Musubi Murder by Frankie Bow. Newly single and far from home, Professor Molly Barda wants to focus on her job and stay out of trouble until she gets tenure at remote Mahina State University. But her life is upended when fast-food entrepreneur Jimmy Tanaka, founder of Merrie Musubis, pledges a huge donation to Molly's college, and then disappears. Molly's bottom-line-obsessed dean tasks her with locating the missing musubi mogul, a quest that lands her in a stew of old grudges, whispered scandals, and murder. Along the way, Molly starts to fall for Tanaka's competitor, the too-good-to-be-true Donnie Gonsalves. Donnie seems to like her for all the wrong reasons--and has a few secrets of his own. What is a Musubi (pronounced moo-soo-BEE)? To ask other readers questions about The Musubi Murder, please sign up. How would you survive and even bloom in a place you never ever expected to find yourself? How did you react to Molly's attitude toward Donny's son, Davison? Have you ever met anyone like Iker Legazpi? Recommends it for: Cozy mystery fans. Hawaii residents and visitors. Disillusioned academics. A masterwork, a tour de force, utterly delightful. You should buy it right now. The Musubi Murder, the first of the Molly Barda Mysteries, is available now on Kindle, at Audible.com, and on iTunes. I found this book quite by accident. I listen to audiobooks when I'm traveling from place to place on Oahu in my MINI or hanging out at the pool or the beach. I was cruising Audible.com one day recently and the title jumped right off the monitor and the book went into my various devices. More than a few writers have tried to place mysteries in Hawaii but few get it right. Frankie Bow has a good ear for the nuances of local-speak. (If you listen carefully, you can tell early on that the book is se I found this book quite by accident. I listen to audiobooks when I'm traveling from place to place on Oahu in my MINI or hanging out at the pool or the beach. I was cruising Audible.com one day recently and the title jumped right off the monitor and the book went into my various devices. More than a few writers have tried to place mysteries in Hawaii but few get it right. Frankie Bow has a good ear for the nuances of local-speak. (If you listen carefully, you can tell early on that the book is set on the Big Island and not in Honolulu.) She also has a very good eye for the elements of local culture and can translate adeptly these images into prose. The behind-the-scenes descriptions of university politics are hilarious. The depictions of the academic quicksands of funding, tenure, political maneuvering, academic (dis)honesty, and political correctness (Office of Student Retention) are spot-on. I won't add any spoilers other than to say that the story takes some very entertaining twists and turns and the reader should prepare for some surprises. An enjoyable & witty cozy mystery! I read this book in audio format. This is a great book for audio as it is set in Hawaii and the narrator delivers authentic Hawaiian voices. I loved this book! 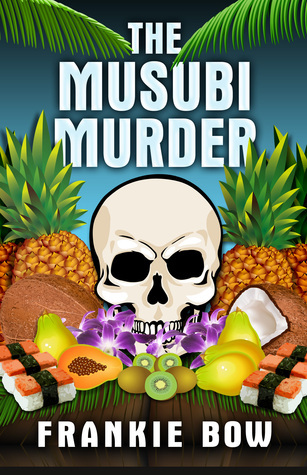 This story "The Musubi Murder" Is a fun, quirky murder mystery. It has a great plot, suspense and comedy. I listened to this book in one sitting. I didn't want to turn it off. Follow along with Molly, a college professor as she solves a murder at a campus in Hawaii. We were listening to this book tod An enjoyable & witty cozy mystery! Follow along with Molly, a college professor as she solves a murder at a campus in Hawaii. We were listening to this book today while at the dinner table and we had many laughs! We were at the part where Molly was complaining about 25% of the students plagiarizing their papers. This book is very enjoyable and family oriented. Lots of danger too! Overall, I enjoyed reading this book, and recommend it to anyone who wants a bit of fun. As the author says herself: this is 'cozy' crime. The plot meanders along and in fact is secondary to the humour, cultural detail (who knew what musubi and coqui were!! ), and highly engaging vernacular. The setting and sub-plots of the small-time university life are true to life,and the characters with their odd-ball relationships are engaging. I love this book! The characters captured me from sentence one. Molly Barda's dry running commentary on everything she encounters, along with the plot's clever twists, kept me delightedly captivated throughout! I couldn't put this marvelous mystery down. I received this audiobook free from the author. A wonderfully fun mystery. Frankie Bow has produced an entertaining cozy filled with well-developed, zany characters who are, in turn, masterfully interpreted by Nicole Gose for listeners. I liked the lady who narrated it alot.It was a cute story, funny too. I would read more of her books. 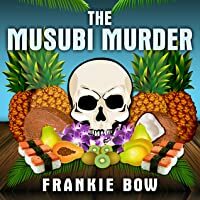 The Musubi Murder is the first in a great new series of mysteries by Frankie Bow, the ‘Molly Barda Mysteries’. I listened to the audio book narrated by Nicole Gose, whose energy and delightful voice inflections and ability to change to reflect each person’s voice kept the attention of this reader and brought the story to life. The characters are witty and fun, especially Molly and her best friend Emma Nakamura. Of all the characters, I most enjoyed Dr. Molly Barda, teacher at the College of Comme The Musubi Murder is the first in a great new series of mysteries by Frankie Bow, the ‘Molly Barda Mysteries’. I listened to the audio book narrated by Nicole Gose, whose energy and delightful voice inflections and ability to change to reflect each person’s voice kept the attention of this reader and brought the story to life. The characters are witty and fun, especially Molly and her best friend Emma Nakamura. Of all the characters, I most enjoyed Dr. Molly Barda, teacher at the College of Commerce at a public university in Hawaii. The life of a professor at a public institution anywhere doesn’t sound like a blast. Frankie Bow writes of tenure, lack of funding, challenges of unmet needs such as chairs in one’s office, working air conditioning, and backing from the Dean or the Student Retention staff with regards to absenteeism or student plagiarism with tongue-in-cheek humor while demonstrating the role that professional educators can play to positively influence students. Even those who plagiarized their research papers, such as Davison Gonzalves and Isaiah Pung. Molly, Emma, and the third member of the group of three close friends, Patrick Flanagan, discuss the mystery at length. There is no shortage of suspects, but there is a shortage of clues and evidence. Patrick is a passionate local newsblogger who is always looking for the big headline, as well as a fellow university instructor. They have known each other long enough to be able to discuss anything, even if they are not on the same page. Then the death of a student is discovered, and the stakes are raised – was he in on the Tanaka mystery, or had he just had a very unusual accident? In the meantime, there was a potential for romance between Donnie Gonzalves, a local businessman, and Molly. Part of that romance depended on the ethics of dating the parent of a student, especially one who is a challenge when it comes to homework. He seemed to improve when he learned that his teacher and his dad were friends. But Donnie was one of the potential suspects, and had many, many reasons – dollars – to want Tanaka out of the way. The primary characters were delightful and intelligent, and all of the characters were defined as much as necessary for their role. It was interesting to hear about life in Hawaii, and about education. Frankie Bow is excellent at using conversation and behaviors to show us about the characters – so much so that I am looking forward to my next visit with Molly, Emma, and Patrick, as well as how the College of Commerce uses the grant from the late Mr. Tanaka. The story kept me guessing throughout, as there were twists and turns that definitely were surprising! It was interesting to learn a little bit about the business models and snippets about anatomy. I most enjoyed that the author was able to keep the story interesting and moving at a fast pace. It was exciting and intriguing, and the pace was further accelerated by the great narration of Nicole Gose, who read and quoted with a sense of urgency throughout. The plot was definitely unique; while the motive is frequently used, I have not read one with similar details. I highly recommend this mystery to adults of any age and older teens. With a grateful heart, I received a copy of this book from the author. All opinions are my own, and no monetary compensation was received for this review. Frankie Bows' first Professor Molly Barda Mystery provides a good platform for the introduction of both the setting and the characters of her new series. I enjoyed the setting, a university campus which, due to financial restraints has a deteriorating infrastructure and decor. The academic staff have also suffered the indignity and frustration of losing all authority over students. Heaven forbid a student be upset, offended or reprimanded lest they should leave, taking their uni fees with them! This situation contributes to some quite comical efforts of self restraint on Molly's part, involving her trying to chastise and punish students for their misdemeanours without actually saying so! Molly has far more patience than I, I would soon be out of a job! I like Mollys' house, OK not the smartest, but probably a whole lot more interesting than the modern hermetically sealed clean and tidy abodes of some people ... Mentioning no names! Then there is the murder mystery, It wasn't too difficult to be a little ahead of the story, but I must say, there were some rather stomach churning inferences along the way regarding the mortal remains! Some of the situations Molly found herself in gave the listener some nail nibbling moments! Poor Molly becomes as bewildered as a teenager when romance - or potential romance - students politics, friends, doubt, money, science, fraud and murder are all thrown in to the melting pot. Luckily for us, it's all spiced up with a little humour, romance and a touch of pathos. I'm just not sure about the ending though. Having said that, it is the first book in a series, and now that everyone has been properly introduced, I look forward to many more Molly Barda Mysteries. Nicole Gose is new to me, I enjoyed her work very much, she certainly is a talent. Her voice is very clear, she has good timing and tells a story well, this is so important. I loved the regional accents, reminded me a little of Maori English. I found one little fault, and even then I guess it's a personal thing, and that is the voice of Emma, it was a little high pitched for the comfort of my ears. I'd say this book makes an excellent audiobook, Nicole Gose as narrator was well chosen, and sound quality and production are both of a high standard. I think listeners would be happy to know that Nicole will narrate all future Molly Barda Mysteries, so let's hope she does. This is a pretty good book in what promises to be a fantastic mysteries series. The setting and university and island life depicted was spot on. The reader follows Molly and her best friend Emma Nakamura as they maneuver through university life in a school that is in a serious funding shortage as well as through their search for answers to why Jimmy Tanaka, a less than ethical businessman who has donated in a big way to the College of Commerce, fails to show up for a breakfast in his honor, and This is a pretty good book in what promises to be a fantastic mysteries series. The setting and university and island life depicted was spot on. The reader follows Molly and her best friend Emma Nakamura as they maneuver through university life in a school that is in a serious funding shortage as well as through their search for answers to why Jimmy Tanaka, a less than ethical businessman who has donated in a big way to the College of Commerce, fails to show up for a breakfast in his honor, and whether or how the mysterious death of a student is linked to this. The duo is joined by Patrick Flanagan, a local news blogger always seeking a headline and fellow professor, in their search for answers to the many questions that abound. Not to be bogged down with this mystery, there is also a romance brewing between Molly and a local businessman Donnie Gonzalves, the father of one of Molly‘s challenged students, who is not all that keen on completing assignments. In fact, Molly wonders if she should even date Donnie, since he is the father of a student. Donnie also has a multitude of reasons to want Tanaka out of the way, most of which involve money. The author has developed a start of what looks to be a pretty good mystery series. The characters, setting and plot are well thought out and developed. There is a lot of humor from the funding or lack thereof for the university as well as the ways they cope with the shortages and their daily university life. School politics, working conditions and how much in control the professors have also lend to the hilarity and realism of the book. I enjoyed reading realistic depictions of life in Hawaii as well as of university life. I think the series will turn out to be quite an enjoyable read for those who are always, like me, looking for a good, cozy mystery to dive right into, one that is realistic and substantive, but not too heavy to read. I look forward to the next book and further adventures of Molly and her friends in Hawaii and the nifty escapades they can get into. I received this from Library Thing to read and provide an honest review. In The Musubi Murder we meet Molly Barda, and her friends, Emma Nakamura and Patrick Flanagan. They are college professors in Mahina, Hawaii. The College of Commerce has budget issues and is literally falling apart around them. I am reading this book just after the Governor of my fine state of Wisconsin has cut hundreds of millions of dollars out of out college system. I hope and pray it doesn’t end of like the college in this story. Jimmy Tanaka, founder of Merrie Musubis, and a man with a shady background, has promised a huge donation to the school but he fails to show up at a breakfast in his honor. Or a least that is what everyone thought. He is there in a way, a way that leads to a murder investigation and Mollie finds herself heavily involved. She is also just starting a relationship with Donnie Gonsalves, but he seems to be a man with many secrets. Not knowing anything about musubi (pronounced moo-soo-BEE) the title was a big draw and when I found they were sandwiches that could be made with SPAM, a childhood favorite, I knew I had to read this story. Frankie Bow has laid the groundwork for a promising mysteries series in addition to giving a very intriguing whodunit that includes not only a bit of revenge but corruption too. I found the characters to be very well developed and the backdrop of college politics very interesting. The humor interspersed throughout the story made it even more enjoyable. How can you go wrong with a setting in Hawaii? A great place I have always wanted to visit. The author has many more installments planned and I am looking forward to them. I love this new series! It's set on a Hawaiian public college campus. The main characters, Molly and Emma, are sarcastic and laugh-out-loud funny. Molly has a PhD in literature but is trying to get tenure as a College of Commerce instructor. There are many thought-provoking discussions about word choice. For example, is it decapitated head or disembodied head? There are asides about how the human body tastes like pork and which way you should squeeze through a crowded theater to your seats--faci I love this new series! It's set on a Hawaiian public college campus. The main characters, Molly and Emma, are sarcastic and laugh-out-loud funny. Molly has a PhD in literature but is trying to get tenure as a College of Commerce instructor. There are many thought-provoking discussions about word choice. For example, is it decapitated head or disembodied head? There are asides about how the human body tastes like pork and which way you should squeeze through a crowded theater to your seats--facing forward or backwards--which I pondered long after the topic has passed. The school administrators act as crazy as you would think they would to retain students. The denouement is both surprising and fair when you think back to the clues among the many red herrings. This book is similar to the Murder with Peacocks series of books in both humor and having really relatable characters that feel like old friends. The narrator has no other books on Audible at the time of this review, which is too bad as I would like to listen to her again. She has the excellent ability to change her voice for each character making it easy to listen while doing other things. She even does male voices that you would swear were being voiced by a man. I liked this book so much that I went to the author's blog, you can just Google it, and was happy to see she has several more books in this series written that are just waiting for release. I'll be sure to pick them up when they come out so I can keep up with the adventures of Molly and Emma. I super enjoyed reading this book! The characters were fun and engaging and just the right amount of quirky. An overworked, underpaid protagonist who claims a busybody and an anarchist as her best friends. Not to mention a yoga ball for an office chair (budget cuts), an oven as extra shoe storage, and the realistic treacherousness of the education system (or really any job at all). Throw in a disembodied head and a bit of extremely practical I received this book in exchange for an honest review. This cosy mystery moves smoothly and is populated with distinct characters who are fun to know. Te reader gets to know the characters. There is more than just a good mystery story here. Another bonus is that the depiction of academia, with all its foibles, rings absolutely true. So much fun to read. Molly Barda and her close friends/colleagues Pat and Emma are unique, likeable and real. The writing is amusing - sometimes laugh out loud funny - without being self-conscious. Very satisfying read, highly recommended. THIS WAS A VERY GOOD BOOK. IT HAD TE MYSTERY WHERE YOU THINK THAT YOU HAVE IT FIGURED OUT BUT THE ENDING IS VERY SURPRISING. THE BACK GROUND FOR THE STORYLINE WAS PERFECT. I WOULD DEFINITELY RECOMMEND IT. Mystery, suspense, and mayhem with a great cast of characters. I won a copy of this book during a Goodreads giveaway. I am under no obligation to leave a review or rating and do so voluntarily. So that others may also enjoy this book, I am paying it forward by donating it to my local library. 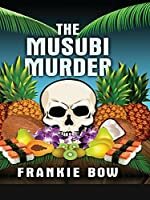 It takes a lot for me to even crack a smile while reading, but Frankie Bow’s wry and witty writing in her debut mystery, The Musubi Murder, had me laughing out loud on virtually every page. Molly Barda, recently arrived in Hawaii to teach at Mahina State University’s College of Commerce, is just settling in to her new job when her life is thrown into turmoil. Local fast-food mogul, Jimmy Tanaka, who had been invited to speak at her department, has gone missing, and Molly reluctantly finds hersel It takes a lot for me to even crack a smile while reading, but Frankie Bow’s wry and witty writing in her debut mystery, The Musubi Murder, had me laughing out loud on virtually every page. Molly Barda, recently arrived in Hawaii to teach at Mahina State University’s College of Commerce, is just settling in to her new job when her life is thrown into turmoil. Local fast-food mogul, Jimmy Tanaka, who had been invited to speak at her department, has gone missing, and Molly reluctantly finds herself sucked into the intrigue that follows. Poking fun at the bureaucratic hell that has overtaken state colleges across the country, Frankie Bow (who in her other life is a professor of business in Hawaii) does a terrific job showing the petty squabbles and power-struggles that erupt when academic egos collide. In addition, through Bow’s colorful writing and authentic characters we are treated to a look at the “real” Hawaii, one that tourists rarely experience—from pidgin-speaking biology professor Emma Nakamura; to feral pig-hunters armed just with bows and arrows; to a Buddhist Bon Dance complete with strings of lanterns, aging hippies, and Spam musubis. I enjoyed this audiobook immensely! The story and characters were engaging and the reader was perfect. I can't wait for the next one to come out. I almost didn't need the mystery plotline at all, since I enjoyed Barda, her colleagues, and the satire of academic life (which I think non-academics can also relate to with corporate politics and such). The work politics part rather reminded me of Connie Willis' "Bellwether." The mystery, itself, was revealed slowly, but this was good because Barda isn I enjoyed this audiobook immensely! The story and characters were engaging and the reader was perfect. I can't wait for the next one to come out. I almost didn't need the mystery plotline at all, since I enjoyed Barda, her colleagues, and the satire of academic life (which I think non-academics can also relate to with corporate politics and such). The work politics part rather reminded me of Connie Willis' "Bellwether." The mystery, itself, was revealed slowly, but this was good because Barda isn't a detective -- rather, she's someone who is caught up in strange circumstances. This was a fun, light mystery. I enjoyed the characters of Molly, Emma and Pat and their struggles with the Student Retention Office at their university. There is a light romance that did not detract from the murder investigation. I thought the ending was a bit abrupt and the confession of the murder was obtained too easily. The narrator on the audiobook was somewhat irritating although I appreciated her use of Hawaiian accents. I was given a free copy of the audiobook by the author. The author’s characterization was great, and the plot was superb. The author placed a special emphasis on setting, which knitted everything together nicely. The author thrusts the reader into the action and never stops. It was a four-star read. I really enjoyed this fun cozy mystery. Fun, quick read with a beautiful setting. Plenty of humor amidst the murder mystery. Recommend for mystery lovers. *I received a copy from the publisher in exchange for an honest review. I started out really liking the main character, Professor Molly Barda. Her difficulties with the administration at her college and various fellow colleagues were very witty and fairly accurate. Her friends, on the other hand, were mooches and, though handy in some aspects, especially at the climax, need some more development to be likeable characters. My biggest complaint with the book was that it was missing a whole chapter. Chapter 23 was a total repeat of chapter 22 and, I fear, there were so I started out really liking the main character, Professor Molly Barda. Her difficulties with the administration at her college and various fellow colleagues were very witty and fairly accurate. Her friends, on the other hand, were mooches and, though handy in some aspects, especially at the climax, need some more development to be likeable characters. My biggest complaint with the book was that it was missing a whole chapter. Chapter 23 was a total repeat of chapter 22 and, I fear, there were some significant revelations by the main antagonist in that missing chapter. Like Molly Barda, Frankie Bow teaches at a public university. Unlike her protagonist, she is blessed with delightful students, sane colleagues, a loving family, and a perfectly nice office chair. She believes that if life isn’t fair, at least it can be entertaining. Her experience with academic publishing has taught her to take nothing personally. “An opportunity?” I repeated, without enthusiasm. Oh, good. Next comes the part where he tells me to be a “team player” and then dumps some tedious task on me.